100% PURE FRACTIONATED COCONUT OIL (MCT): Like Virgin Coconut Oil, Fractionated Coconut Oil MCT (Medium-Chain Triglycerides) is loaded with nutrients and antioxidants making it a great moisturizer. Fractionated Coconut Oil is colorless, odorless, and will always remain in liquid form. 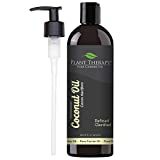 INDISPENSABLE GENERAL CARRIER OIL: Fractionated Coconut Oil can be used on its own or with any essential oil or blend. It absorbs rapidly into the skin without leaving behind a greasy residue. It's a must-have for dry, dehydrated skin and to help hydrate hair, restore shine and luster. BATCH SPECIFIC GC-MS REPORTS ON EVERY OIL: Every bottle of oil from Plant Therapy goes through multiple rounds of testing including organoleptic testing by Robert Tisserand, an essential oil expert, and multiple rounds of GC-MS testing by several third-party laboratories. HIGH-QUALITY AFFORDABLE ESSENTIAL OILS: At Plant Therapy our goal is to positively impact the lives of as many people as we possibly can, by selling such a high quality product at an affordable price. Be confident knowing you are purchasing quality oils at direct-to-consumer prices. CERTIFIED AROMATHERAPISTS ON STAFF: Our customers are our #1 priority and we'd love for you to join the Plant Therapy Family. Our Certified Aromatherapists are happy to help you with all of your Essential Oil questions. We want you to be confident and satisfied with your purchase. The International Federation of Aromatherapists does not recommend that Essential Oils be taken internally unless under the supervision of a Medical Doctor who is also qualified in clinical Aromatherapy. All cautions listed for individual oils do not include those cautions from ingestion. This statement has not been evaluated by the Food and Drug Administration. This product is not intended to diagnose, treat, cure, or prevent any disease. Bottles are filled by volume. Some bottle sizes may not be filled to the top, but do contain the volume of oil specified. Plant Therapy Jojoba Oil. 100% Pure, Cold-Pressed, Natural and GMO-free Moisturizer and Carrier Oil for Essential Oils. 4 oz. Plant Therapy Lavender Essential Oil. 100% Pure, Undiluted, Therapeutic Grade. 10 ml (1/3 oz).